A sailor who had to abandon his solo bid to sail around the world in record time has returned to the UK. 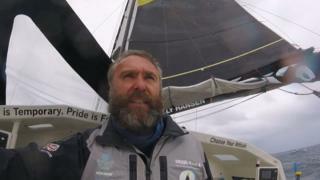 Alex Alley, from Gosport, had hoped to become the fastest mariner to make the trip alone in a Class40 boat. Shortly after reaching the halfway point the track for the mainsail on his boat, the Pixel Flyer, was damaged. Mr Alley said he broke down in tears after making the decision to stop the challenge, which had taken nine years to plan. He found the mast track on which the mainsail runs on a series of "cars" had a chunk missing, which meant the sail could not slide up and down. Mr Alley, who crossed the start line for the challenge on New Year's Eve, spent 75 days alone at sea and had travelled about 13,400 miles (21,565 km) when the sail jammed. He said: "I spent two days trying to work out a solution - but then I realised it was something I just couldn't fix it at sea. "It's a little piece of track that would cost about £100 to replace. It was the straw that broke the camel's back." Mr Alley was forced to head to Adelaide and stop the record attempt. He said: "I felt a massive responsibility to all the people that had crowdfunded for me - I was in tears - I just felt I had let everybody down." The 48-year-old sailor raised the money for the record attempt by selling 5cm squares on the side of the yacht and corresponding pixels on his website. "The whole purpose of the challenge wasn't just to break the world record it was to prove that if you want to do amazing things and you want to live your dreams you can do it," he said. The World Sailing Speed Record Council is reviewing the satellite tracker from Pixel Flyer to see if he set an intermediate world record. The current record for the journey in a Class40 vessel, set by Chinese sailor Guo Chuan, stands at 137 days, 20 hours, 1 minute and 57 seconds.